Sue and I went to Cambridge today: Sue on church business, me to wander around the bookshops and drink coffee. I always enjoy poking around Cambridge’s bookshops: bit of a busman’s holiday, I suppose, but I’m an addict. The Park & Ride features hi-tech advertising these days, with scrolling headlines from cambridge-news.co.uk: it told me that Libra Aries, one of Cambridge’s independent bookshops, is due to close on Sunday. Not an auspicious start to the day: it brought back memories of another trip to Cambridge, back in 2008, during the SPCK bookshops debacle. 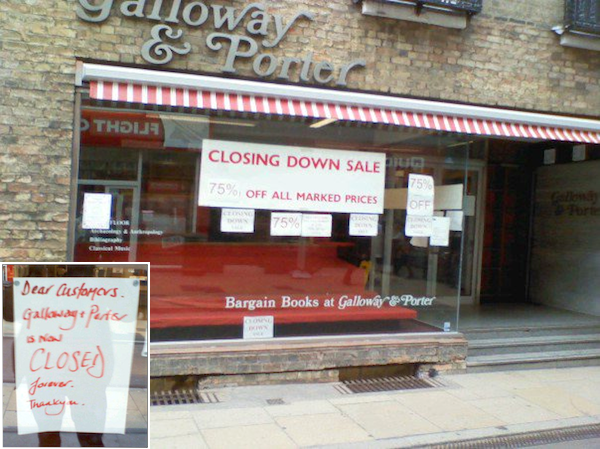 Dear Customers, Galloway & Porter is now CLOSED forever. Thank you. I loved that shop: it was more than a shop — it was an institution. There was rarely a visit to Cambridge when Sue and I didn’t leave with an armful of books from Galloway & Porter: they had a superb theological section and almost always had some gems in stock at prices we couldn’t resist. Galloway & Porter, RIP. We miss you. Welcome! This is a notice is for people who don’t read notices. Which means you, gentle reader, are in the wrong place. But since you’re here, perhaps you can help me. 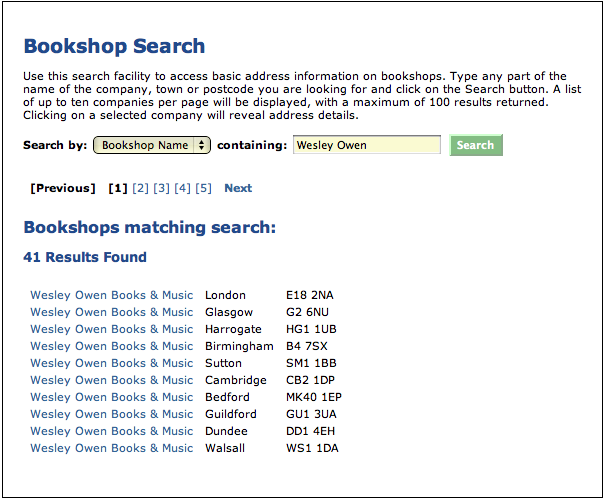 For my day job — when I’ve got nothing better to do, you understand — I run a college bookshop. We have a couple of notices on the door about our opening times. But every time a college vacation comes around, customers wander in and ask if the shop will be open during the vacation. The other is very simple: it says OPEN on one side and CLOSED on the other. Most of the time we remember to flip it around, but we like to make it easy for people: when the shop’s open, we have the lights on and the door open; when it’s closed, we have the door closed and most of the lights off. There was a time when I wondered why people who can’t read would want to visit a bookshop anyway; but we sell chocolate as well now, so non-readers have a good reason for visiting too. But all in all, I’m left wondering: would it be better to take down the notices, since so many people don’t read them? Or is it best to leave them there so that when people don’t read them I can point to them? Is that really what notices are for — like speed limit signs on the roads, not there for people to read but to be pointed at afterwards when they’ve ignored them? If you know, please do tell.